We finally got our beloved Colorado weather back! It has been sunny for the last three days and I think the rain is gone for good. Actually, my guess is that next time it gets cloudy and dark it’s probably going to be a snow/rain mix. Those are real fun. But that’s just what happens in the fall around here. When the sun goes away, it is cold. But I have to say, it is so worth it. The leaves started to turn about a week ago, but right now they are just so pretty. Still big patches of green, but with patches of yellow leaves on the verge of tuning red. Every morning when I hike I honestly see the little changes that happen each day. It could not be more pretty. I know I have said it before, but this time of year and the next three months are my favorite time of year. Every year I wish I could just slow time down because every year I swear is busier and busier. So this year I have decided (like just this very second) I am going to live fall up the best I can and the best way I know how. Fall is all about the foods. Pumpkin (!! ), butternut squash (my favorite), pecans, sweet potatoes, APPLES, caramel, lots of crockpot meals, hopefully soups + stews, chocolate (chocolate is an all season, all the time food around here) and hopefully it will all be coming you way soon. It’s been a rough few days in the kitchen. Like real rough. Let’s hope this string of bad days work itself out soon. I can’t take any more. Or actually roasted pumpkin seeds. One of my all time favorite fall snacks. 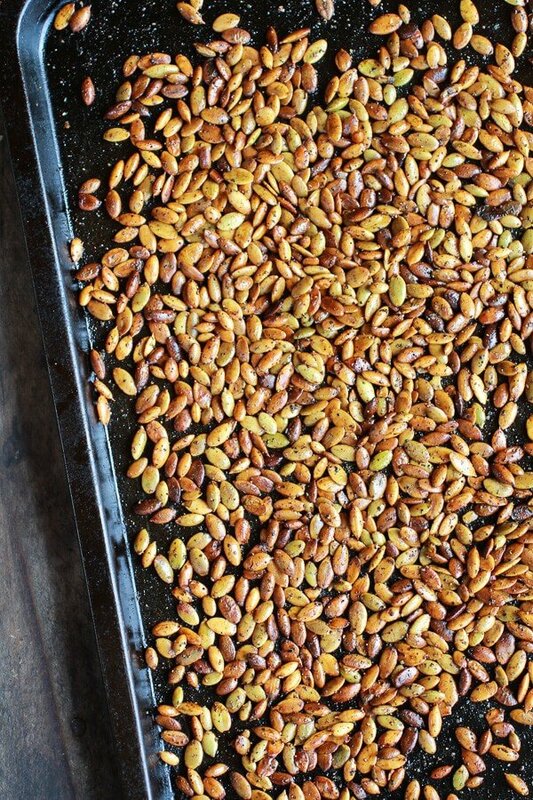 These pepitas are just shelled pumpkin seeds and basically it is the easy way to eat pumpkin seeds. No carving the pumpkin (even though I do love doing this), no straining or drying the seeds, just cut open the bag and roast! So easy, so good! The seeds get coated in some chili powder, smoked paprika, salt and pepper and then along with the seeds I roasted up some garlic, cause I mean, why not? 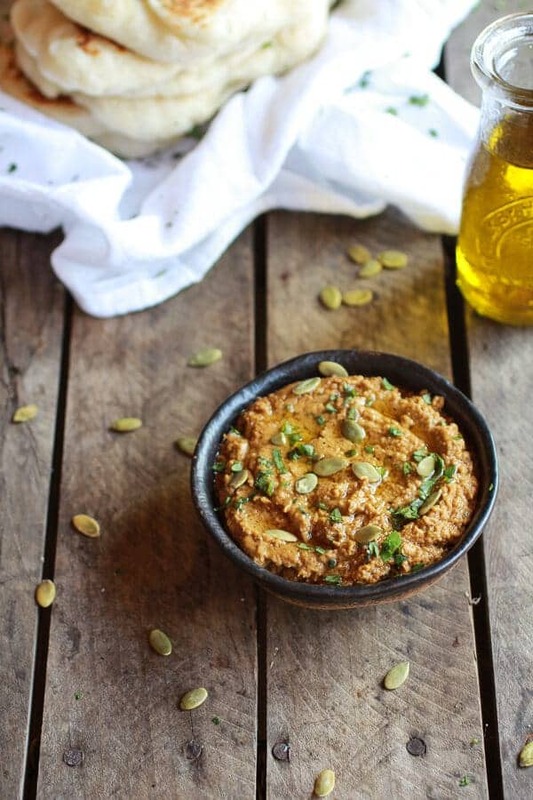 It’s fall and I kind of love roasted garlic, plus it works really well with any hummus! Then all you have to do is purée the pumpkin seeds into pumpkin seed butter, add the beans, purée some more and then start dippin! 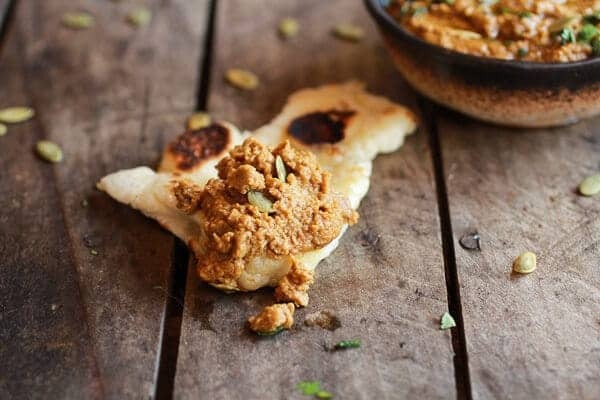 I highly recommend making some of the homemade naan or homemade pita bread. HIGHLY recommend it. Oh and one last thing. How on Earth do you get those cool line/divot things on the top of the hummus to make it look all pretty like this. I tried for like and hour. Impossible. A perfect dip for fall! Right on the pan add the the pumpkin seeds (pepitas), 1 tablespoon olive oil, 1/2 teaspoon smoked paprika, 1/2 teaspoon chili powder, salt and pepper. Toss well with you hands. Add the garlic cloves to one side of the pan (leave them in their skin). Roast for about 15-25 minutes or until seeds are cooked and begin to lightly brown. Remove the pan every 10 minutes to stir the seeds and check for doneness. Remove from the oven, let cool 5 minutes and then peel the skin away from the garlic. If the the garlic is not tender and fragrant when the seeds are done roasting, wrap them in foil and continue to roast until soft and roasted. 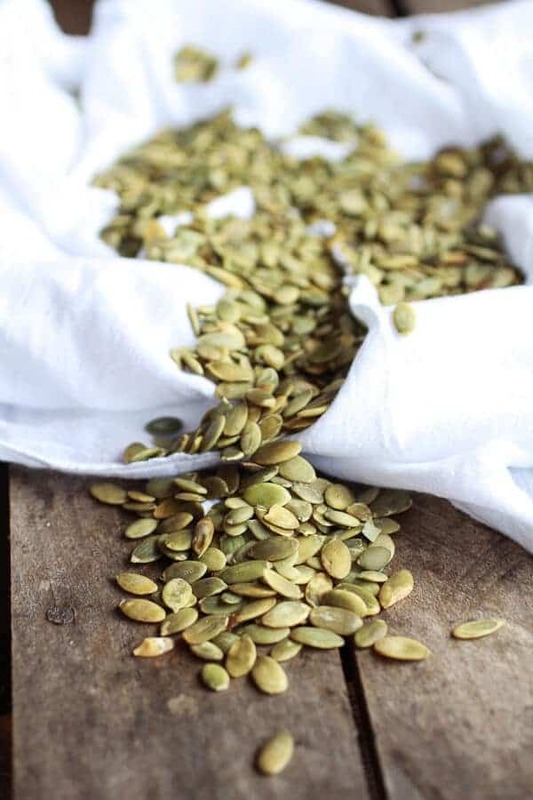 Add the pumpkin seeds to a food processor and process until a smooth paste forms, scrap down the sides as needed. This took about 5 minutes. Once the pumpkin seeds form a paste, add the beans, lemon juice, and garlic. Pulse and blend until combined and the beans begin to puree, about 2-3 minutes. With the processor still going, stream in olive oil, blending continuously for a few minutes (and scraping down the sides if needed) until as smooth as desired. Add the remaining, 1/2 teaspoon of chili powder and smoked paprika. Blend until combined add some salt + pepper and taste, adding more if desired. 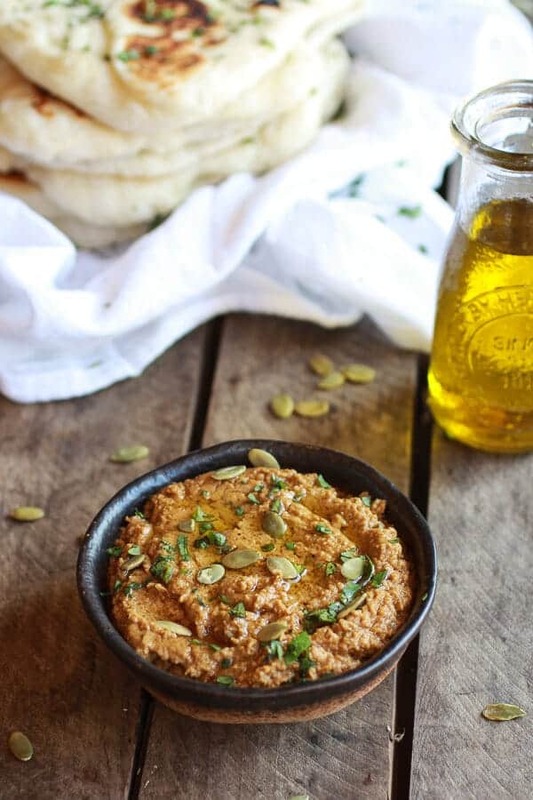 Add hummus to a bowl and drizzle with extra olive oil. Start dippin! Whatever, I am over it. Wow that looks so creamy and flavorful and I love these images, Tieghan. Pinned! Just gorgeous, Tieghan! And, very creative. I want to dive right into that beautiful bowl of hummus and eat it all. Thanks for sharing, girl. Pinned! 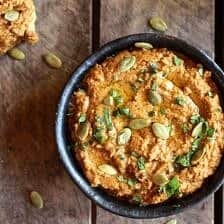 I love pumpkin seeds, and think this hummus would make a gread addition to a fall-flavored sandwich. After serving some first as a dip. I definitely need to make this hummus!! I have some raw pumpkin seeds. Making this this week!! Oh yeah!! I hope you love it! Let me know! Love this! Will have to try for sure! 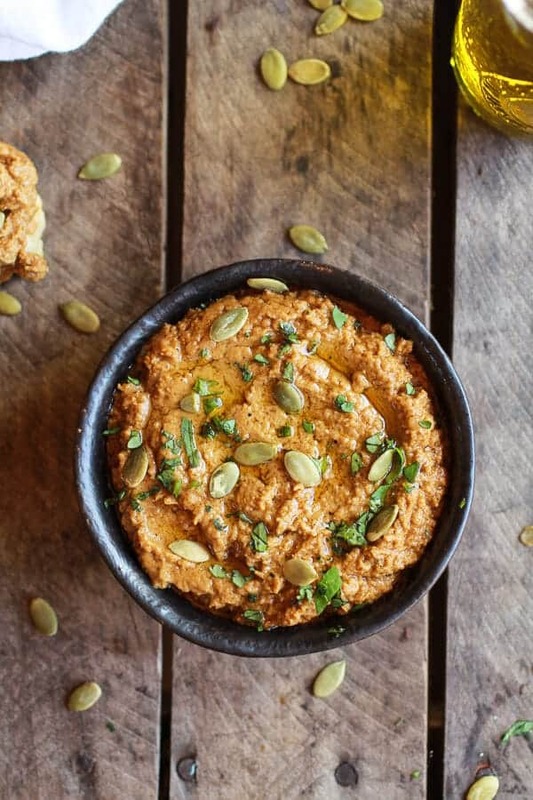 I’m addicted to hummus yet I’d never tried a pumpkin seed version. It looks wonderful and I have to try it like right now. Thanks for the great idea & pinned! Thanks so much, Consuelo! I hope you love this hummus! I had no clue hummus could be made out of seeds and I’ve always loved both pumpkin seeds and hummus. This is the perfect snack for fall! Glad to hear you folks in Colorado are hanging in there and experiencing normal weather again! Thanks Julia! Oh and it totally rained and thunder all day today. Snow is not on the mountains. LOL! That hummus looks sooo delicious! 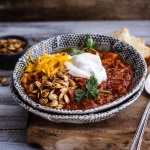 Great recipe with lots of terrific flavors, thanks for sharing! Thank you so much and for pinning too! I love hummus and I’m always looking for new flavors. This looks incredible, pinned! Thanks so much Laura and for pinning too! 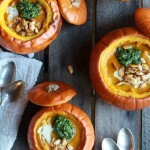 I LOVE roasted pumpkin seeds (you totally just gave me a craving ;)), so I imagine that I would LOVE this! Now that’s creative my dear! Totally sharing this on friday links! Awe, thank you so much!! You are so awesome to share!! I love the fall! 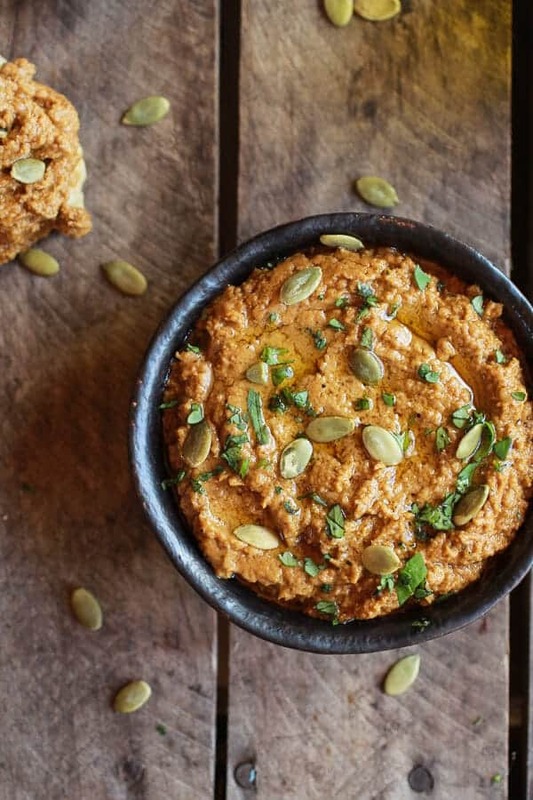 I have never roasted pumpkin seeds, but I want to try just to make this hummus. YUM!! This is brilliant, Tieghan!! I bet the flavor of the roasted pumpkin seeds is fantastic! Tieghan, I can’t wait to try this recipe! Every year, I carve pumpkins with my husband and his family. We carve, like, 7 pumpkins, so we end up with so many pumpkin seeds. Just an insane amount of pumpkin seeds, really. We end up throwing so many of them away, but now I know a good use for them. Thanks so much for the inspiration!! Thanks Jamie!! That sounds so fun and I hope you love this hummus! I have to say though that I have never tried it with the shells on the seeds. I am not sure that would work?? Let me know! That is a simply a beautiful looking hummus. 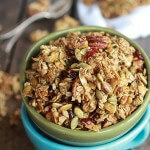 Never tried it with pumpkin seeds, a great idea and your pictures are so beautiful. Pinned it. Yum! Pumpkin seeds just might be my favorite thing about fall. And they are such a good snack! Love that you used them in hummus. Thanks Des!! I love pumpkin seeds too! I’m drooling for hummus now. What a wonderful recipe. You don`t mind if I borrow it? 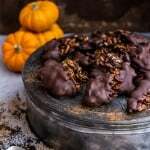 Looks like an absolutely delicious recipe and I think I will try it at our next Halloween Party. Thanks! P.S. This is not a Hummus. Hummus is the Arabic word for chick peas. its like if I made mashed potatoes out of beans but still called it mashed potatoes. My seeds never made a paste! But I love the flavors. When do you add the lemon? Help! I’m making for a party tonight and it is way too thick. What should I do? Thanks!